While working in an organization, an employee cannot take off on a vacation at his whims and fancies. He needs to get a proper permission from the bosses to do so. He needs to apply for the permission and may have to write a proper and official letter. Using a vacation request form surely makes this easier. These Request Forms comprises of all the important segments that help you in making the request. A business organization uses this form to allow its employees to request for the vacation that they are allowed in lieu for the hours of work that they put in. In this form, the employee needs to enter the details of extra hours that he may have worked. 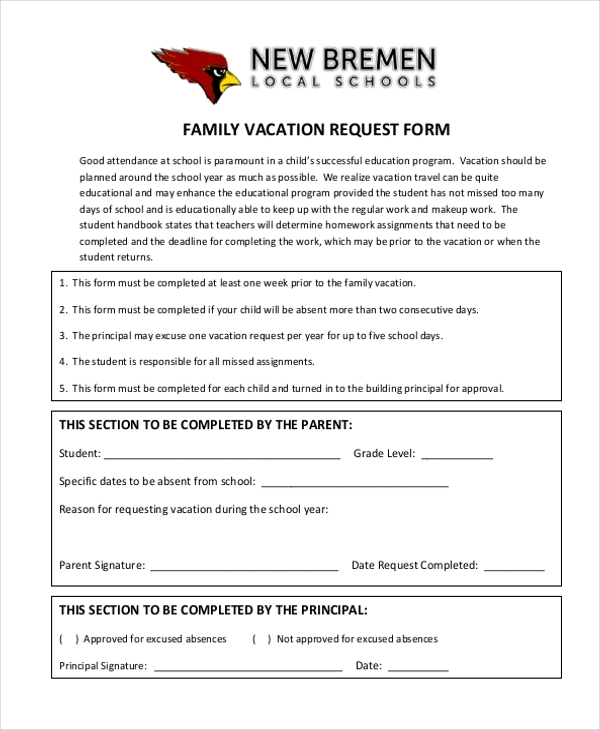 You can also see Vacation Request Forms. Business organizations often offer to pay for their employees even when they are on a vacation. However, the employee needs to file a request for this. It is for this purpose that the aforesaid form is used. As the name indicates, this form is used by an employee to request for leave to go on a vacation. In this form, he needs to add in his personal details and the number of days of leave required dates that he wishes to go on etc. Companies offer a time off to their employees after they have put in certain hours of work. 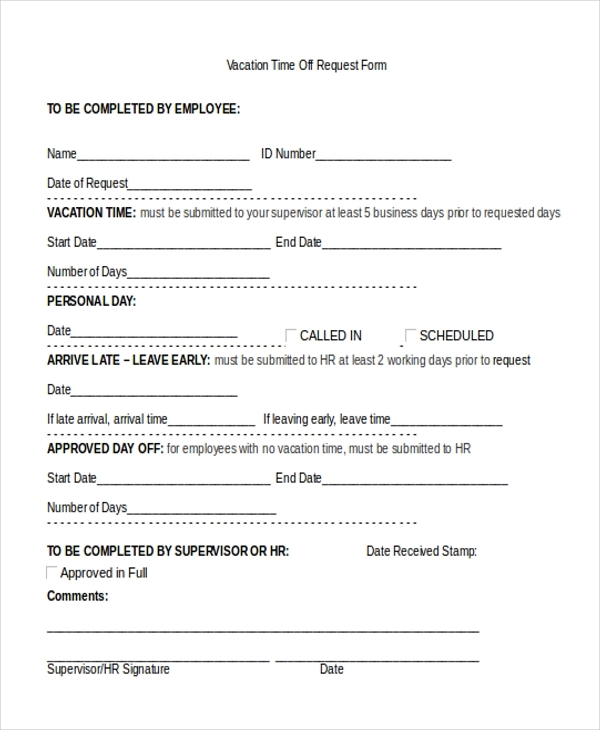 So, once an employee has completed this work time, he can use this form to request for a vacation time off. You may also see Time Off Request Forms. 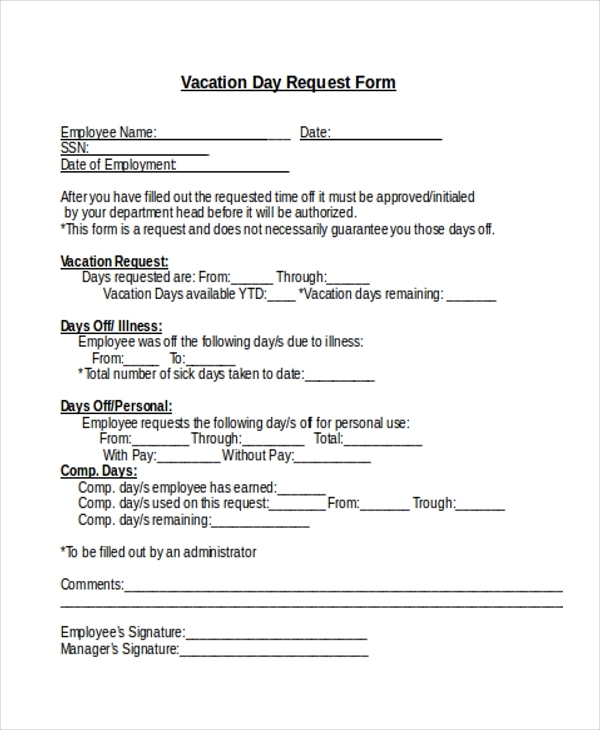 Organizations that allow an annual vacation to their employees make use of these forms. Their employees can use this to request for their annual vacation and need to define they dates they want to leave for. 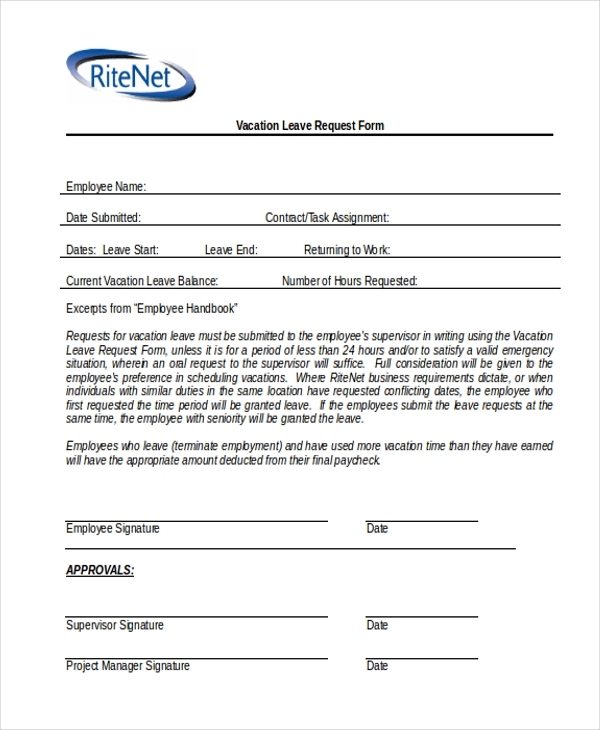 Organizations make use of this form to allow their employees to place a request for a vacation. The employee is required to fill in the details of the vacation like the number of days, dates etc in this form. An organization that offers family vacations to its employees uses this form to allow them to raise a request. 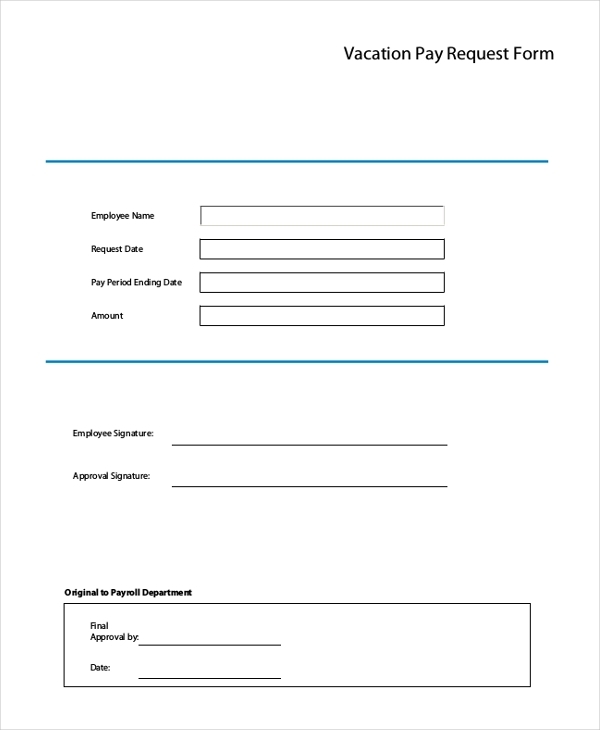 By using this form the employees can request the company to pay the vacation amount and sanction the leave. 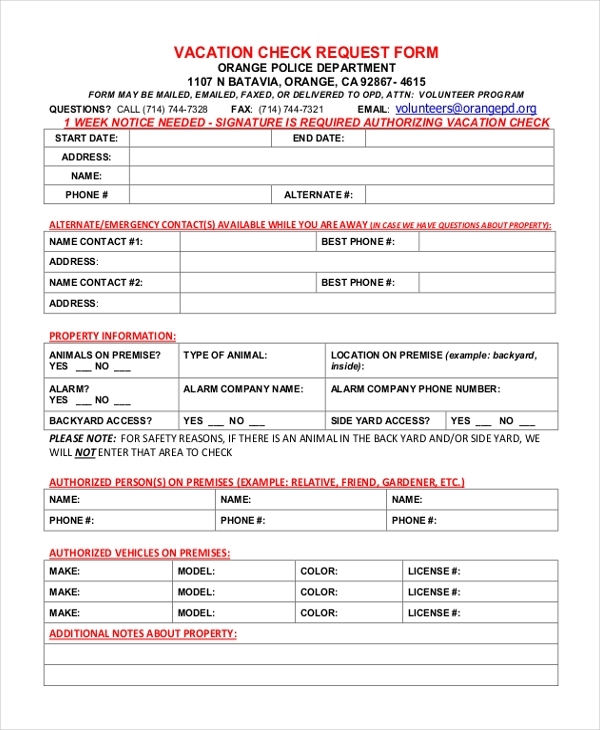 This form is used by a security agency or the police department to allow its patrons to request for a timely check of their home and premises while they are on a vacation. You can also see Check Request Forms. 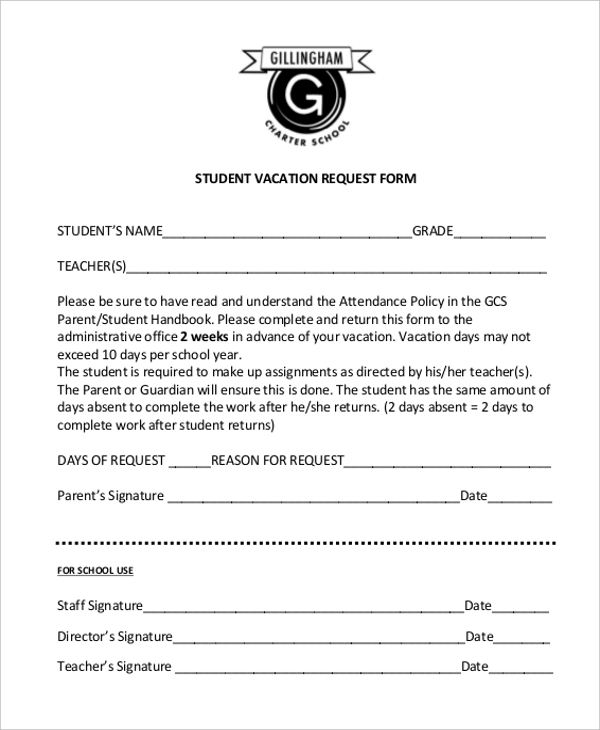 Educational institutions make use of this request form when they plan a trip for their students during the summer vacations. They define the various destinations in the form and ask the parents to take a pick. When a person wishes to send a request for a vacation and wants the same letter to be signed as approval, he can use the aforesaid form. It comprises of all the segments which are required for such a request. 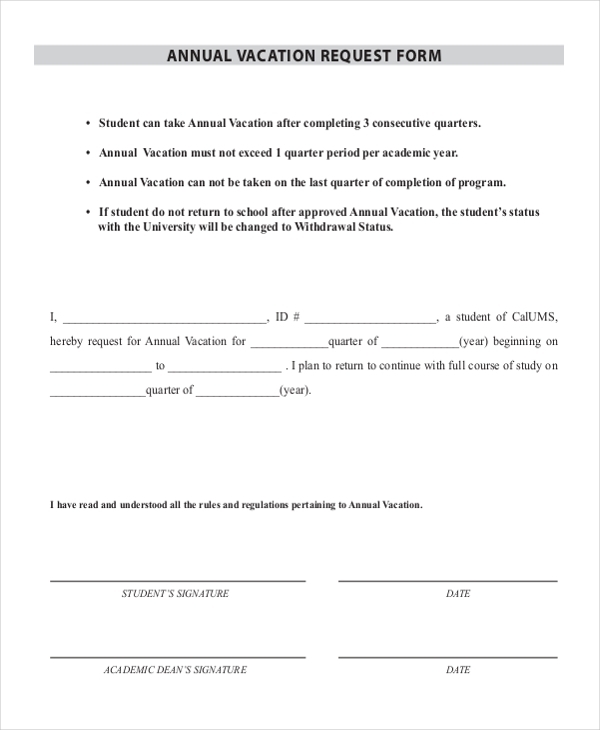 When a student wishes to go on a vacation during the school/college term, the institution asks him to fill this form with his request and then submit it to the authority concerned. You may also see Event Request Forms. 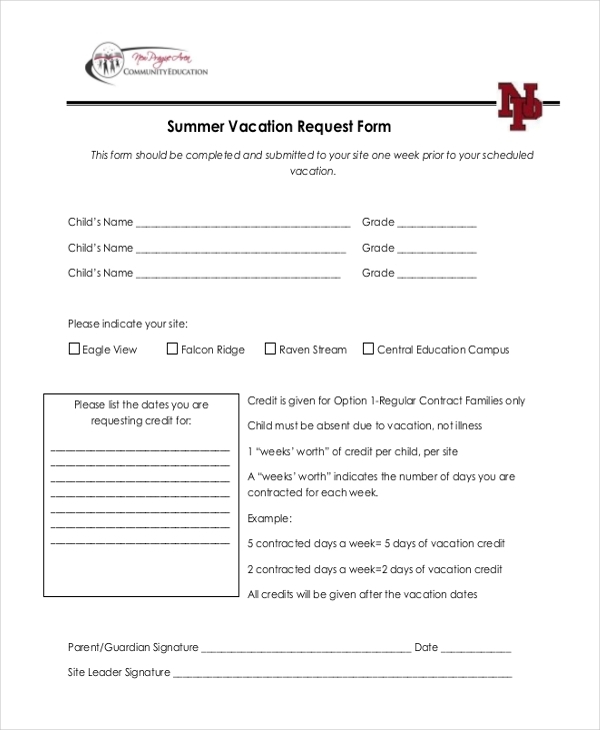 What are The Benefits of Using Vacation Request Forms? Need some help in designing a vacation request form? We have a wide range of vacation and Leave Request Forms to choose from. Pick the one that is perfect for you and download it. You can easily customize it such that it suits your needs. These forms help in saving a lot of your time.